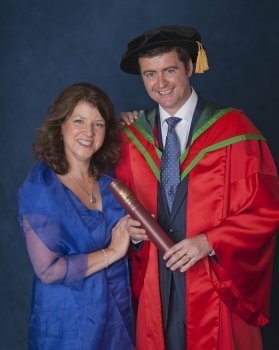 Software engineer Brendan Mooney today received the honorary degree of Doctor of Science (DSc) from the University of Ulster in recognition of his services to business development in Northern Ireland. Mr Mooney is Managing Director of successful Belfast-based software company Kainos. Brendan Mooney attended school at Loreto College in Coleraine, where he studied Compuer Science, Economics and Geography for A Level. In 1985, Brendan started studying Computer Science at University of Ulster, Jordanstown, graduating in July 1989 with a BSc Computer Science, 2(i). Following university, Brendan joined Kainos 1989 as a software engineer working on projects in the manufacturing and telecommunications area, for international clients. In 1994, he moved to Dublin to set up Kainos’ Ireland business , completing a variety of roles including project management, pre-sales consulting and general manager. In 2000, Brendan returned to Belfast, taking over the role of Managing Director in 2001. Outside Kainos, Brendan has served on a number of additional Boards including technology company Meridio (2001-2004) and the Probation Board for Northern Ireland (2009-2012) and has served as a Lay Magistrate for the Courts Service of Northern Ireland (2005-2012). Brendan is married to Eileen, whom he met at Jordanstown and they have three children, Ciaran, Katie and Odhran.